When you're just starting out as a freelance translator, it's hard to think of anything else besides wanting to get as much work as you can, as quickly as possible, right? And then, just when you think all of that was never going to lead anywhere, a job opportunity lands in your lap! This is it! This is what you've been waiting for. You instantly take the job, right? How you deal with potential clients and jobs from day one will set the tone for how you continue to deal with them as your business develops and grows. Just like anything you're new to, you will eventually learn the warning signs of monster clients, and learn how to best negotiate for your own interests as well as the interests of the client. 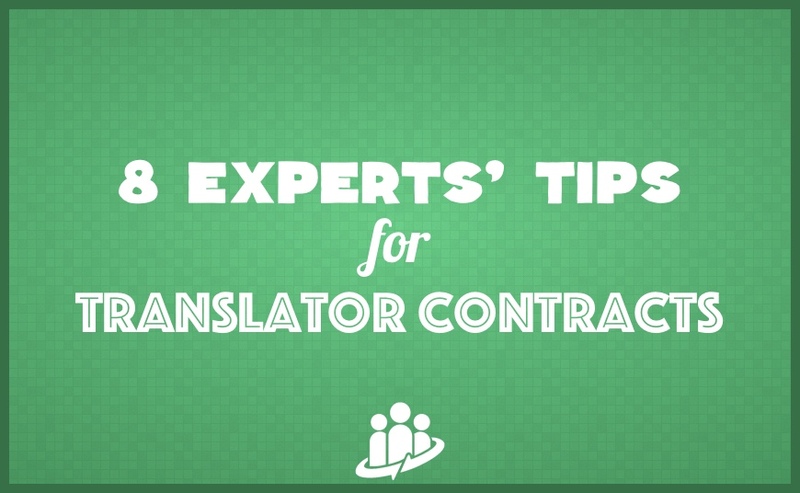 In an effort to help you avoid costly beginner mistakes, I've asked eight expert translators from our TM-Town community to give you their top pieces of advice, tips, and precautions when any new contract lands on your door step. a) Agreeing not to get paid until the end client pays the agency - The agency is a company and should have the liquidity to be able to pay you before the client. However the agency might not want to pay you before they know that the end client is happy with the translation. b) Agreeing to indemnify (hold harmless) the client against lawsuits and/or claims resulting from your translation. The client should have a quality control system in place so that an error by one translator doesn’t have a disastrous effect on final project. c) Agreeing not to accept or solicit work from agency’s clients. Of course you should not go behind a clients back to steal the client for yourself, but you cannot know each and every client the agency has. d) Agreeing not to subcontract work to another translator. OK, agreement, just make sure you follow this if you agree to it. If you find a clause in a contract that you do not agree to, you can cross out the clause in question, modify it, or refuse to sign the contract. Some agencies will agree to a change, others will refuse to work with you if you do not sign their contract. Just realize that if you sign a contract, its terms are legally enforceable. (1) Is the project in one of my areas of specialization? It's important to specialize early so that you can work better and more efficiently, and it puts you in a position to justify higher rates. Having a limited number of specializations also helps you "brand" yourself online and attract more work. (2) Is the client reputable and offering an acceptable rate? Early on especially, I feel it's important to focus on working with agencies--they take care of most of the busy work and give you an opportunity to learn the ropes--but you need to avoid the bottom-feeders. Join Proz.com if only to get access to their Blue Board, because this will help you to figure out if you can trust an agency you've never worked with before. (3) Is the timeframe reasonable? Actually, low rates and unreasonable deadlines tend to go hand in hand and are both red flags that you should avoid the client. Urgent jobs happen, of course, but it's never the best way to start a relationship with a new client. Be prepared to say no... The client is NOT always right... You must sometimes educate your clients. Don't be afraid to drop your prices. I have always believed that it is better to sell 100 items at 1€ than wait along for that one magical client to buy one thing at 100€. Start off low and gradually increase your prices as your workload increases. Go up a couple of points every few months. In a year you will have probably doubled what you are getting paid per word. Old clients can either pay more, or you can say a polite good-bye, leaving the door open to future colaborations if your "well-paid" workload decreases. Before getting to work with a company, make sure you do proper research on it. Check its Blue Board record on ProZ.com and their entry on Glassdoor.com, and google it to see if there is any relevant information on the web (e.g. forum posts and articles). This way you'll be able to see what the vendors and in-house employees of this company think about it, as well as what the general attitude toward it is. Be wary of working with companies and agencies from developing countries. Pay particular attention to clients from India, Pakistan and China, because that is where most scammers come from. That is not to say you should avoid clients from these countries -- there are some wonderful agencies down there -- but be extra cautious when dealing with them. Don't try to outbid your competition by offering an unreasonably low rate. Even if you win the project, this will hurt in you in the long run. Position yourself as a professional, not a bottom-feeder. Always first check the company on the Proz.com Blue Board and Paymentpractices.net, and if they don’t look 100% trustworthy, avoid them like the plague. To use the Proz.com Blue Board, you will need to join Proz, which I highly recommend every fledgling translator to do. Re Proz: remember that a complete and active-looking profile is the key to getting work via the site. Paymentpractices.net is very cheap (only around €20 for an annual subscription, and there is a free 7-day trial). Make sure to get a proper PO (in the form of an email or PDF) with clear details about the job (rate, number of words, deadline, client’s payment details, etc.). Also check that you are being properly paid for the actual number of words in the document(s). There are various ways unscrupulous project managers (who are "just following orders") have of shaving off a word or two. Figure out what these are and be vigilant. If accepting to translate a PDF, make sure either the agency will provide you with a decent conversion into an editable format, or you know how to do this yourself (I recommend ABBYY FineReader). Figure out what you are worth, and make sure not to accept a rate much below that. You can always go down, but negotiating your way up at a later stage can be very difficult. How can you figure out what you’re worth? Find an established translator who works in your language pair, and ask them to have a look at your work and perhaps suggest what they think you could charge given your current level of quality. Thoroughly check payment terms that are specific to client's country’s laws and fiscal regulations. Search for sentences like, "Any issued purchase order that stays uninvoiced for more than 3 months will be voided." You or your client actually can't change these clauses. But at least try to amend your invoicing procedure accordingly. Please make sure that the amount of your responsibility for the delayed delivery or some quality issues doesn't exceed the project total amount. It's useful to include a clause about the client's responsibility in case of payment delay (for example, 0.5% of invoiced amount per day of delay). It usually helps to prevent your client from delaying the payment process. I've been working on negotiation skills for quite a while now and I'd love to share some of my experience with you. People and businesses that basically tell you that you're too expensive. Businesses that can easily afford your services but are looking for a better (cheaper) deal. People that can't afford your services but they're very interested in working with you. Depending on the category, you should plan a different strategy to persuade your potential client. Also, it's important to set a minimum rate and stick to it. Your first offer should be at least 1/3 higher than this minimum rate to have a considerable margin to negotiate. The main objective of negotiation is to find a win-win solution for your client and for you. Here are a few of my points. Let me know if you have any questions/comments! When a new potential clients calls me I always respond in a positive way, but I never make any commitments over the phone. I ask them to first forward me the documents (even if it's just one sentence). What's the purpose of the translation: internal use, end customers, website, mailing or a print brochure? What's the file format in which the client would like the translation to be delivered? What's the language variant (I translate into Dutch for the Netherlands, but if the client wants his marketing brochure translated for Dutch in Belgium I'd refer them to a colleague). Would you like the translation to be edited/checked by a 2nd translator? Should the final PDF files be proofread as well? Usually I can already guess the answers to most of the questions, but I still ask them. This gives me the opportunity to get to know the client better and built trust. After that I send them a price quotation, including all the points we've discussed, my Terms & Conditions and often a deadline for them to respond (e.g. This quotation is valid until <... 24 hours later >). The next day I usually give them a quick call, to ask if they've received my quotation and whether they have any questions about it. I really hope this advice has been helpful to you. I’d love to hear what you’ve learned specifically from the above tips, as well as what lessons you may have learned from your own experiences that weren't mentioned above. Finally, please take two seconds to share this post as a way to thank the contributors for sharing their years of knowledge and expertise. Patrick Roye shared another helpful article: What Are the Rules for Paying Translators’ Invoices? Germany Posted about 3 years ago. An excellent article with solid tips by our colleagues here on TM-Town – a must-read for newcomers and veterans alike. Japan Posted about 3 years ago.